(Should this woman be lynched? “The dogs may yap and howl, but the caravan of denial moves on.” – Persian proverb. 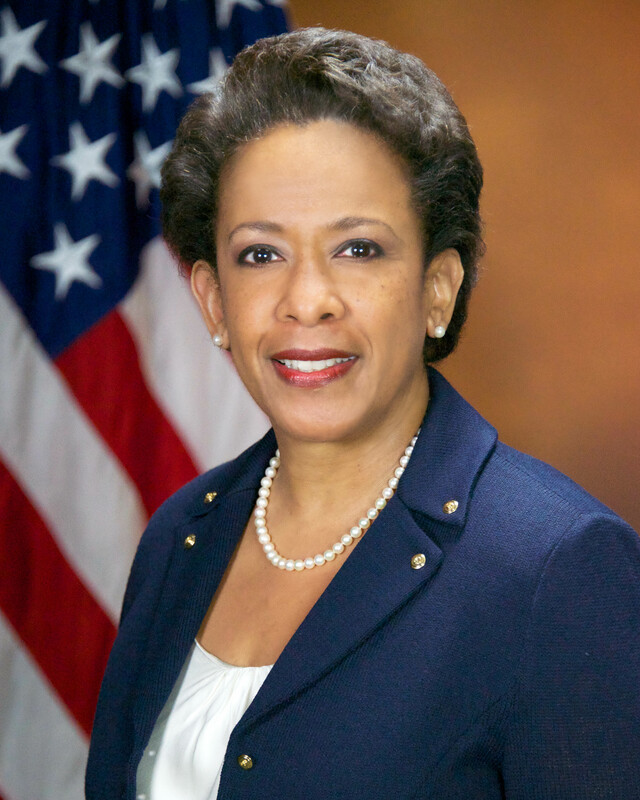 The disgraceful US Attorney General Loretta Lynch (above) today confirmed that, in the wake of the Orlando massacre, the Obama administration’s caravan of official denial will continue as usual. Undeterred by the loud protests yapping at her from right of centre, she shamelessly announced that the DOJ will be scrubbing all references to Islam and ISIS from the transcripts of Omar Mateen’s calls to 911 before they are released to the public. Thus the Obama regime’s craven submission to Islam, in fragrant violation of the truth, continues unabated, despite howls of protestation from everyone who recognises an out and out white-wash when they see one. The massacre had nothing to do with Islam, the White House will say, and are censoring all evidence to the contrary to prove it. Instead of the public admission that Islam’s demands for the killing of everyone that Allah hates inspired the Orlando gay night-club massacre, Obama and his bunch of fellow-travellers have decided that blame should be shifted elsewhere. Despite Mateem’s allegiance to ISIS the motive has to be found elsewhere. Anywhere. That is, it should be blamed on any one, on any thing, anything but on the deranged beliefs shared by the Muslim community. A community which equally deranged (but equally useful to Allah) Leftist ideology proclaims to be a persecuted minority. That is, a persecuted minority just like the Gay and Lesbian community, every one of whom Sheik Shady Alsuleiman – and probably another 1.4 billion like him – suggested should be killed out of compassion. However, greatly-respected Koranic experts, such as our very own Islamist lick-spittles, that Andrew O’Keefe half-wit, and that very stupid Scott Ludlum, believe to the contrary that the historically-oppressed Muslims are in solidarity and in great sympathy with the equally historically-oppressed Gay community. And so Islamists like Shady and Omar Mateem must have got it all wrong. Because of this idiocy, and the Muslims who have spouted this idiocy to the bunch of gullible Leftist idiots who believe it, the massacre has to be blamed on some other bunch of idiots. Or on something else. On mental illness, on the NRA, on lax gun laws, on the Republicans, on homophobia, on the Christian Right, on Donald Trump, on the man in the moon – on the Bossa Nova. Blame it on anything or anyone but the Islamic killing machine that has now been murdering and massacring its way through history for the past 1400 years. For it just can’t be Islam’s fault, can it? Despite this killing machine’s institutionalised Sharia laws demanding the slaughter of everyone that is hateful in Allah’s sight – especially homosexuals – Islam, nevertheless, must be innocent. And its adherents, Muslims, must be, as a logical consequence of such stupidity, repeatedly declared pure as the driven snow – innocent until the cows come home, according to Leftist dogma. And so Islam must be defended at all costs. It is imperative that Muslims be portrayed by the Left in nothing less than glowing terms: anything, but confess that they got it all wrong, and that it is indeed a murderous, and hateful ideology which actively seeks to destroy everything and everyone in its path. Otherwise the Left’s entire rotten caravan of treachery and appeasement will come to an abrupt and screeching halt. So, after the Orlando massacre, how can the Left here in Australia manage to keep up this charade? How can it, so to speak, keep the caravan moving along and pretend that everything about the Muslim community is just hunky-dory? That is, despite most of their Muslim mates probably – out of compassion – secretly thrilled to bits about the Orlando massacre and looking forward to more? For one, how about inviting a bunch of Muslims to an “end of Ramadan” celebration at Kirribilli House, with a slippery husband and wife con-artist team sitting right at the PM’s table for the media to gush and fawn over? That way, hopefully, the media won’t notice all the other despicable trash, homo-phobes and potential mass-murderers hiding in the background. For two, when asked on 3AW by Neil Mitchell if Islam is homophobic, how about trying to get the PM not to ramble on and not to screw up his reply too much? That way the public can continue to believe that Malcolm Turnbull is not lying to us about the true intentions of a bunch of closet psychopaths, just to get their votes. This entry was posted in Malcolm Turnbull, Omar Mateem, Scott Ludlum, Sheik Shady Alsuleiman, Waleed Aly and tagged Andrew O'Keefe, Malcolm Turnbull, Omar Mateem, Scot Ludlum, Waleed Aly. Bookmark the permalink.